Consider joining IDOE’s Literacy Community of Practice! Join by filling out this form. 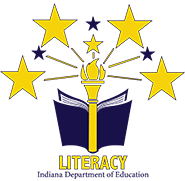 The Literacy Team sends out monthly communications about literacy best practices, research, ideas for the classroom, and literacy leaders across the state. View our past newsletters here. Follow the work of the IDOE Literacy Team and connect with other Indiana educators by using #INspirEDlit on social media!